On June 7, 1956, President Eisenhower suffered severe stomach pains that sent him to Walter Reed Army Medical Center. He had experienced stomach problems for years, but this time, doctors determined that the cause was ileitis (an inflammation of the ileum, part of the small intestine) and that surgery was needed immediately. The surgery by Major General Leonard D. Heaton took 2 hours, a long procedure for a man who had experienced a heart attack less than a year before, but doctors felt they had no choice. The President, upon being told he needed surgery, had said simply, "Well, let's go." The first five days of Eisenhower's postoperative convalescence at Walter Reed were especially "rough" . . . . The doctors had him walking on the second day and eating on the fifth, but they could not get rid of a troublesome infection around the incision. Thereafter the recovery was uneventful, although the president never escaped from depression about what he perceived to be the slowness of his improvement. His impatience at the end of the first week prompted Mamie to write, "I am going to put the 'Slow me down Lord' prayer in the president's mirror when he gets home as a daily reminder, and I think it is most apropos." The doctors decided to release the President on June 30 because they thought a change of scenery, namely his home at Gettysburg, Pennsylvania, would expedite his recovery. The President was uneasy about the decision, according to Lasby, but deferred to the doctors. Shortly after the surgery, the doctors predicted the hospital stay would last about 15 day, but it had turned out to be 21 days. The President had another good restful night. He slept almost continuously for nine hours. His temperature is 98.2; pulse, 72; blood pressure, 120 over 70, and respiration, 18, all of which are normal. He held his gain in weight [163 pounds]. To prepare for his departure on June 30, the President walked down a flight of nine steps to the next lower floor and then back up again. For the first time since the surgery, the President had three working sessions. To preserve his strength, the 27 bills he had to sign were divided into two batches--13 in the morning, 14 in the afternoon. In addition to those two sessions, the President met with Vice President Nixon. Press Secretary James C. Hagerty told reporters the two had discussed only the Vice President's upcoming trip to the Philippines. The Vice President would represent the President at the 10th anniversary celebration of Philippine independence on July 4 and travel to Vietnam to meet with President Ngo Dinh Diem. When reporters asked if the President had discussed whether, in view of his latest medical setback, he still intended to run for a second term, Hagerty replied that, "there has been no talk about his personal plans." The President signed the Federal-Aid Highway Act of 1956 without fanfare and without being photographed. The Dwight D. Eisenhower Library is unable to locate any record of the circumstances, or even who was present. It appears, though, that Hagerty was in the room. The President did not issue an official statement on the signing, but Hagerty, in announcing that the bill had been signed, told reporters the President "was highly pleased." The pens used by the President were set aside, to be sent to those who had been instrumental in passage of the legislation. Among those receiving pens were Senator Al Gore, Sr., one of the chief authors of the bill, and Alf Johnson, Executive Secretary of the American Association of State Highway Officials. His condition has progressed satisfactorily at the hospital and he now enters his convalescent stage. It is expected that he will be at his home at Gettysburg for at least two weeks. Pertinent blood chemistry determinations are within normal limits. The President's temperature, pulse, blood pressure and respiration have been constantly normal. Throughout the post-operative period his morale and spirits have remained high. In addition to walking freely around his suite today the President this afternoon walked up and down a flight of steps. The improvement in his physical status this last week has been most gratifying. That night, the President dined with Mamie and their son John and his wife Barbara. The following morning, the President's departure from the hospital, scheduled for 8:30, was delayed 30 minutes, during which White House chauffeurs "ran to and fro with luggage, phonograph records, manila envelopes and the like," according to an account by Mary McGrory in The Evening Star of Washington, D.C. Some 200 people watched from the lawn across the street. Faces appeared in most windows of the four-floor hospital. A huge platform had been set up at the head of the driveway for nine television cameras. The driveway was filled with cameramen. 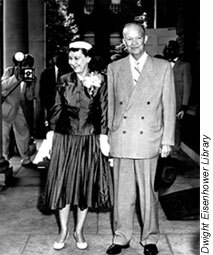 Finally, at precisely 9:00, the President and Mrs. Eisenhower appeared in the doorway of the hospital. He was wearing a tan suit, while Mrs. Eisenhower wore a figured silk suit, a white hat, and a white corsage. As the President and Mrs. Eisenhower paused for photographers, he took off his brown felt hat at their request. The couple, with the President's arm on his wife's, walked slowly across the 20-foot stone porch then paused again at the top of a five-step staircase. They "stood holding hands and smiling. Mrs. Eisenhower's eyes were glistening with tears." A photographer called out, "Give us that wave, sir," referring to the President's characteristic way of greeting crowds. The President replied, "All right, but only one." The President and First Lady walked carefully down the stairs before saying goodbye to Brigadier General Jack W. Schwartz, acting commander of the hospital. The President said he had enjoyed the past few weeks and was told by the General, "We are certainly going to miss you around here." The President, although pink-cheeked as always, seemed paler than on his last public appearance 23 days ago on the eve of his operation for ileitis. The lost weight he suffered during his illness was not immediately noticeable. His eyes were bright. A photograph of the event shows the opposite, that the President was noticeably lighter and appeared weaker. When they reached the black, air-conditioned Imperial limousine, the President smiled and nodded at reporters and photographers. Mrs. Eisenhower entered the car first, "and the President got in unassisted, but very gingerly." The President's motorcade moved slowly away, headed for a drive along the two-lane highways between Washington and the Eisenhowers' Gettysburg farm. The following day, July 1, the President and Mrs. Eisenhower celebrated their 40th wedding anniversary. They had been married on July 1, 1916, at her family's home in Denver. Gettysburg did seem to have a positive influence. His first night there he said he felt better than on any preceding night, despite the drive from Washington. Snyder was delighted after a week because Eisenhower's appearance was improving, his anxiety was rapidly disappearing, his appetite and digestion were good, his elimination was all it should be, he was walking around the farm, and he was enjoying his putting green. Still, the recovery to full strength took longer than expected. The infection in the incision continued to bother him, as did a lingering depression. John Eisenhower, as Lasby noted, "never saw his father look worse until the last days of his life." As for the patient, his goal was to be at full strength for a trip to Panama that had been postponed because of the surgery until July 20. The old man was to go to Panama July 21, and that Friday before he left, he was a sorry sight. And he said to me privately, "If I don't feel better than this pretty soon, I'm going to pull out of this whole thing." So he goes down to Panama, almost gets crushed by the mobs, meets God-knows-how-many Latin American diplomats, suffers through all the damn receptions-and Tuesday, Tuesday, mind you, three days later, he comes waltzing back looking like a new man. The President's heart attack in September 1955 and the ileitis surgery in June 1956 did not prove to be the boon the Democrats had hoped for. Although they did not want to make the popular President's health a direct campaign issue, they did want to emphasize the danger of electing a President who might not make it through his 4-year term. In part, they did this by focusing on Vice President Nixon. For example, the Democratic nominee, Adlai Stevenson, said, "The American people have the solemn obligation to consider with utmost care who will be their president if the elected president is prevented by a higher will from serving his full term." Stevenson's suggestions that an Eisenhower victory would mean a diminished presidency did not ring true because by election day most Americans considered the president the more healthy of the two candidates. Indeed, the prominent irony of the campaign was that the fifty-six-year-old challenger ended weary and hassled, while his sixty-five-year-old rival appeared vigorous and relaxed . . . . Stevenson ended up "absolutely exhausted," as one friend put it, or in the words of another, "just an animated shell of the real Adlai." President Eisenhower was reelected by an even wider margin than he had recorded in his 1952 campaign against Stevenson.